Sharon Turpie is the Science Specialist. 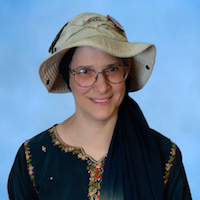 She has over twenty years teaching experience including nine years at Hebrew Day Institute, six at the Hebrew Academy and seven at Hebrew Day School. She also worked at the Silver Spring Learning Center and was a science specialist for the camp program. Prior experience includes public school substitute teacher and as a teacher at Gan Israel Preschool in Howard County. She has taught many grade levels, from preschool though seventh grade. She has a teaching degree from the University of Maryland. She lives in Kemp Mill and has four children.